Much more than a cookbook, here Mr. McClane displays his encyclopediac knowledge of all things fishy by sharing with the reader fascinating information not only on how fish are prepared, but how they are caught, their natural history, and some of the cultural connections that in many societies make fish and shellfish more than just food. 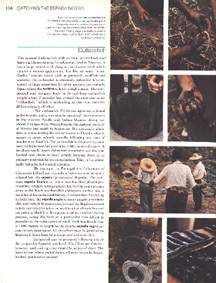 The page reproduced above, for example, is from the entry on cutlassfish, a fish virtually unknown in the U.S. Here Mr. McClane goes into well-illustrated detail on a traditional Portugese fishery for a similar species, the black scabardfish. With 20 pages on Sole, 14 on Oysters, 17 on Cod and similar depth on other popular species, it's obvious that if if it has to do with catching, preparing or eating seafood, you are very likely to find it here.